The 3000mAh (typical) battery of the Honor 7C is designed for longevity, maintaining over 80% of its capacity even after 500 full recharges. The USB connector is lined with a metal protection layer, ensuring it can hold up to being plugged in over 10,000 times. 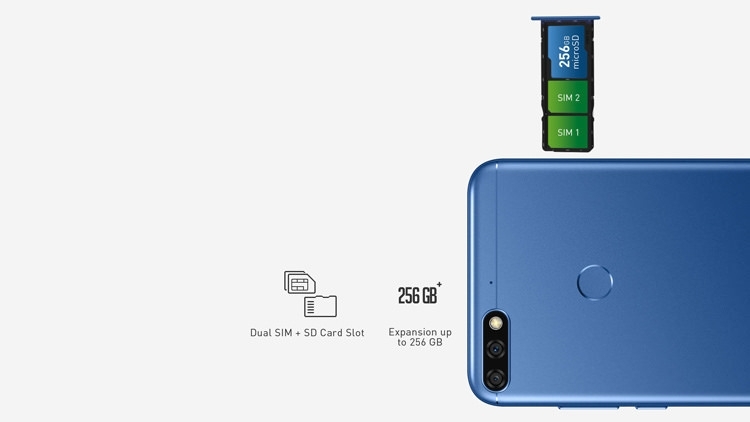 The Honor 7C features a dual SIM + SD card slot, enabling you to use one for calls and another for data connectivity. You can also insert a microSD card of up to 256GB to store photos and data. The sleek body of the Honor 7C comes with a classic rounded-edge design that fits comfortably in your hand.